Cambro GBLSMCLR GoBag™ Small Delivery Bag Liner - 13 1/2" x 9 1/4" x 7 3/4"
13 1/2" x 9 1/4" x 7 3/4"
14" x 9 1/4" x 12 1/2"
20 1/2" x 14" x 11"
Cambro GBFSM000 GoBag™ Small Metal Delivery Bag Liner Frame - 13" x 10" x 9"
Prevent messy leaks or spills during transport from damaging your Cambro GoBag™ with this Cambro GBLSMCLR GoBag™ small delivery bag liner! Featuring a clear vinyl material, this liner is perfect to use as a protective layer in your delivery bag so you can have peace of mind that your GoBag™ will stay as fresh as the contents within it. The durable plastic material holds up against tearing or ripping, so no leaks or messes here! This reusable liner will keep up with the high demands of your delivery service and can be easily lifted out of the bag for a quick and easy cleaning. 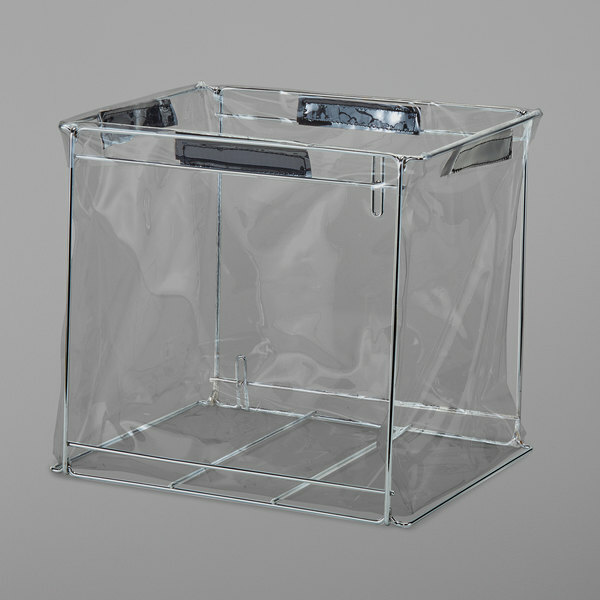 Used in conjunction with the Cambro GBFSM000 small metal delivery bag liner frame, this liner can have added structure and stability. The added Velcro™ lining secures around the metal frame as well, which will help hold up anything that is placed in it. Easily transport your pizza, chicken, Chinese food, burgers, salads, and so much more, all in this clear vinyl liner!